Latschar Mennonite Church (now Mannheim Mennonite Church) in Petersburg, Ontario. The Mannheim Mennonite Church in Petersburg, Ontario was founded by Swiss background Mennonites from Pennsylvania. The congregation, originally known as Latschar Mennonite Church, built their church on land purchased from Isaac Latschar in 1836. The congregation formally organized in 1832 and worshiped in homes for several years before the church building was constructed. The first building was occupied in 1839 and Jacob Hallman is considered the founding leader of the group. The transition from German to English occurred in the early 1900s. Subsequent building programs took place in 1853, 1908, and 1980. In 1980 the church building was moved up the hill, turned 90 degrees, and attached to a schoolhouse that had been purchased years before and had served as the Wilmot Township No. 9 schoolhouse. A new entrance and fellowship room were also constructed at this time. The congregation often struggled with dissension, particularly over leadership issues. Demographics and the congregation's location have also contributed to the congregation's struggles. However, the congregation was able to celebrate its 175th anniversary on 8-9 October 2011. Bearinger, Jesse and George Milne. "History of the Mannheim Mennonite Church." Mennonite Archives of Ontario. Burkhardt, Ferne. Full Circle: Mannheim Mennonite Church, 1836-1986. Petersburg: The Church, 1986, 74 pp. Burkholder, L. J. A Brief History of the Mennonites in Ontario. Kitchener, ON: Mennonite Conference of Ontario, 1935: 84-87. "Mannheim Mennonite Church." Mennonite Heritage Portrait. Web. 26 January 2012. http://www.mennoniteheritageportrait.ca/Report.php?ListType=Collections&ID=114. Mennonite Reporter (24 November 1980): 11; (27 October 1986): 15. Milne, George. "History of the Latschar Mennonite Church." ca. 1960, 3 pp., Mennonite Archives of Ontario. Rogalsky, Dave. "Viability is No Longer the Question: At 175, Mannheim Mennonite Church Looks Toward the Future with Hope." Canadian Mennonite (14 November 2011): 18. Address: 1494 Bleams Road, Petersburg, ON N0B 2H0; located 1 km west of Mannheim on the north side of Bleams Rd. Epp, Marlene and Richard D. Thiessen. 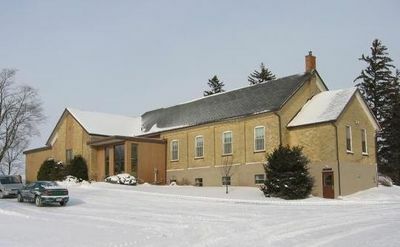 "Mannheim Mennonite Church (Petersburg, Ontario, Canada)." Global Anabaptist Mennonite Encyclopedia Online. January 2012. Web. 23 Apr 2019. http://gameo.org/index.php?title=Mannheim_Mennonite_Church_(Petersburg,_Ontario,_Canada)&oldid=142571. Epp, Marlene and Richard D. Thiessen. (January 2012). Mannheim Mennonite Church (Petersburg, Ontario, Canada). Global Anabaptist Mennonite Encyclopedia Online. Retrieved 23 April 2019, from http://gameo.org/index.php?title=Mannheim_Mennonite_Church_(Petersburg,_Ontario,_Canada)&oldid=142571. This page was last modified on 2 January 2017, at 07:17.